Today, I went and looked at the IKEA Strandmon. I’ve been eyeing it for a while. When it finally because available, I got my tushie over to that big, blue, boxy building as soon as I had the time so I could check it out in person. I loved it as much I had hoped. It was a little more firm than I’d expected and a lighter shade of grey than it had appeared on my computer monitor, but both those things are actually improvements over my expectations. 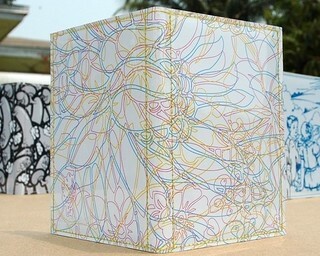 And really, it’s a very pretty seat. The chair was tall enough that I could comfortably lean back and rest my head but not so big that the armrests felt too high. They were the perfect height for me to relax. The side profile was a graceful curve that upped the elegance factor. 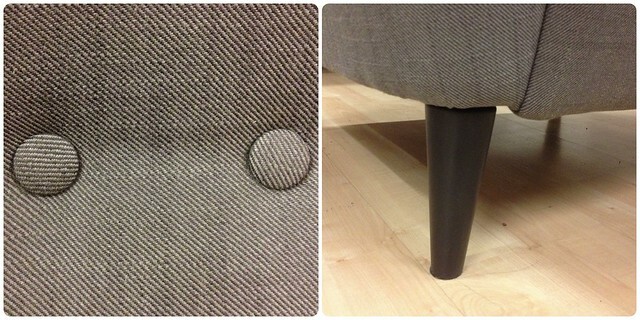 The woven texture of the grey material was soft and made the chair feel so inviting. The legs were simple and tapered; I might want to accent them with some little metallic paint like this. There were a couple of things that gave me a bit of pause. First, this is not a slipcovered chair. Not that I expected it to be with those clean lines and button-detail, but so much IKEA furniture is slipcovered that it’s a little sad that this isn’t. Second, unless you already have one, the ottoman is a must. At least for me, it is. That would add $79 to your purchase for a grand pre-tax total of $358. 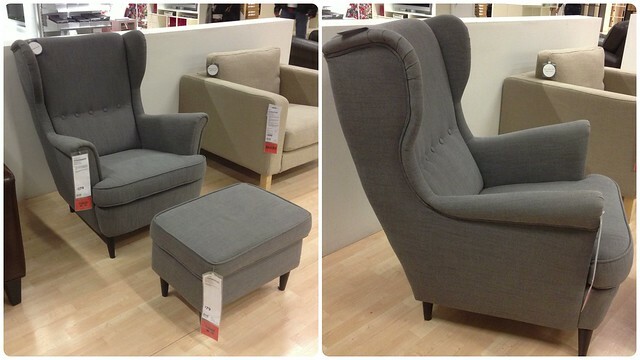 You could skip it, but without an ottoman, you couldn’t take full advantage of the loungey-ness of this chair and that would be a crying shame. Seriously, it’s a small price to pay for the max comfort. That said, thank goodness I do have ottomans. In conclusion, sign me up for a couple of these beauties! Of course, we don’t currently have room for the chair in our house (imagine my sad face here). 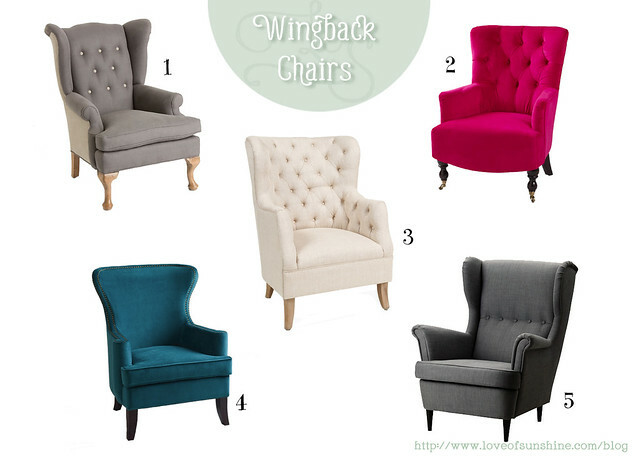 But that doesn’t keep me from dreaming about owning a wingback. I love the Strandmon but because it’s not (yet) mine, I reserve the right to have a wandering eye. Here are a few chairs that have caught my eye recently. I love the bright colors of the Nina and the Elliot chairs from World Market (especially that peacock blue), but I’m not sure I’m ready for such a bold statement from my furniture. I’m still happy to let my accessories be the ones that shout that loudly. I also love the Howell but that’s almost twice what we spent on our sofa†. The Cafer seems really cozy and inviting, but chances are it will be sold out by the time I’m ready to pull the trigger. Of course, when I do pull that trigger (credit cards have triggers, right?) it will probably be for a Strandmon. It kind of stole my heart. † We have a PB Seabury, which we got for about 70% off because it was a floor model and it was a discontinued model on clearance. It was also exactly the sofa we wanted to buy in the exact color we wanted. We had saved up for the full price and had no idea we’d get so lucky. Score! 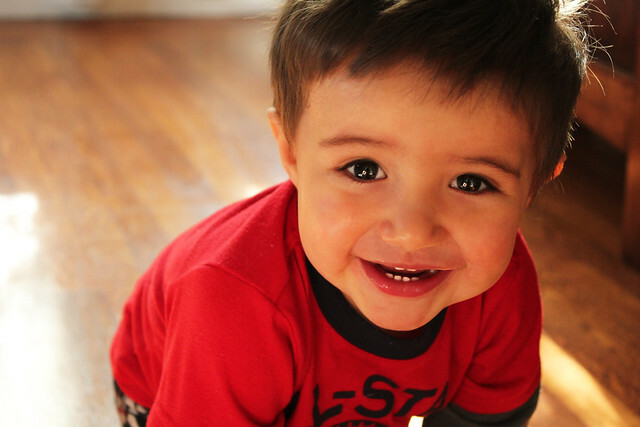 First…Just a photo of Lil’Man for his Mimi. She was worried that, after our talk about Instagram, we’d no longer post photos of Lil’Man. So, this pre-haircut photo is just for you, Mimi! We now return to your irregularly scheduled blog post. Our dining room floor has been bare for a good long time. Until recently, the room wasn’t much used unless we had guests. We tend to eat at the bar in our kitchen (yes, even as a family) instead of setting the table and eating there. 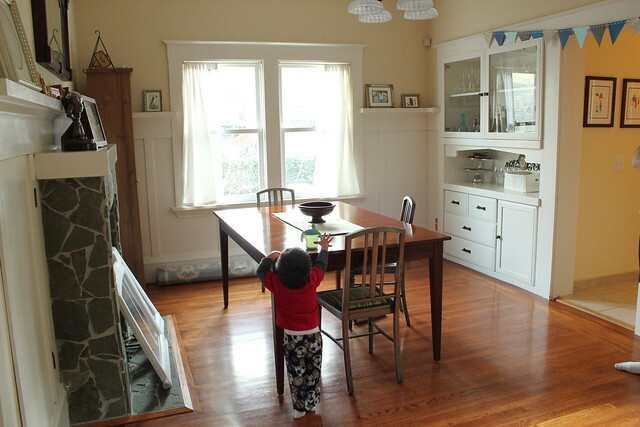 It works for us: there’s plenty of room at our kitchen island and when Lil’Man throws food on the floor, it’s fairly easy to clean up the tile. Plus, I like that he can watch us cook. I talk to him about what I’m doing whenever he sits up and wants to see. He gets excited when I use the blender or food processor — when he sees me pull it out, he screams, “LOUD!” because he loves how noisy they are. Then we all start yelling, “Yay! Loud!” and throw our arms up in the air. So. Much. Fun! But I digress. I decided it was time to get a rug for our dining room. Not because we’re eating at the dining table more, but because the table is becoming a bit of a fort for my two boys to play under. Lil’Man has always loved running under the table, but a few months ago he had a growth spurt. 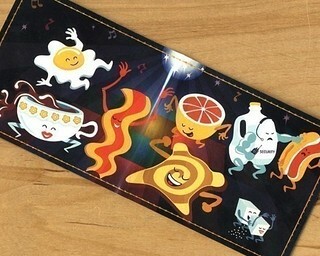 Suddenly, he was bumping his head on the bottom edge of tabletop. Since then, he’s had another growth spurt. Standing up straight under the table is a thing of the distant past for him. 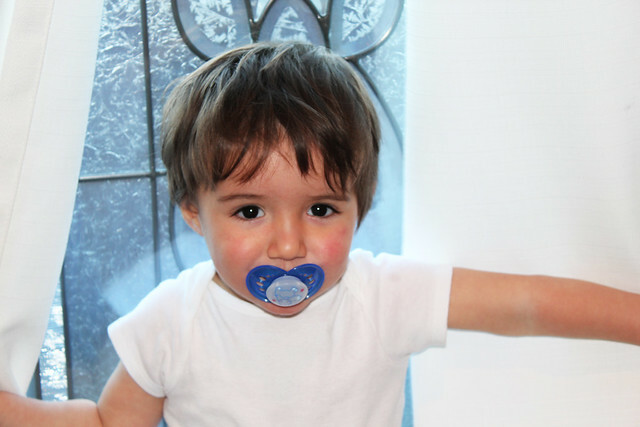 He grew so quickly that he’s still getting used to being careful not to bump his head. Now, he throws himself down on his hands and knees before crawling under the table. And I do mean throw. It’s like he’s diving to get under there as quickly as possible and it makes me cringe every time I hear it. There are growth plates in those little knees, right? I need to protect them! So, a rug and a rug pad suddenly climbed higher on my priority list. 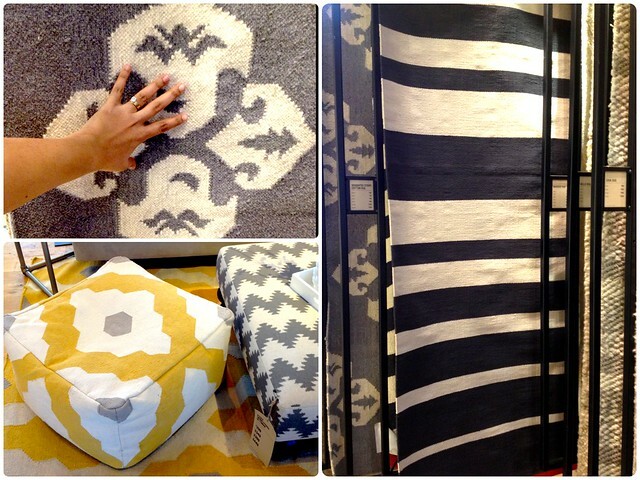 I’ve been drooling over the Andulusia Rug at West Elm and the Casablanca Rug at ZGallerie. We also considered buying a used rug either from a friend or from Craigslist. After talking with the Mr, we decided to go look at the Andulusia. He wasn’t as thrilled with the color choices for the Casablanca and we’d had bad experiences with used upholstery, so he preferred we just go for a new rug. 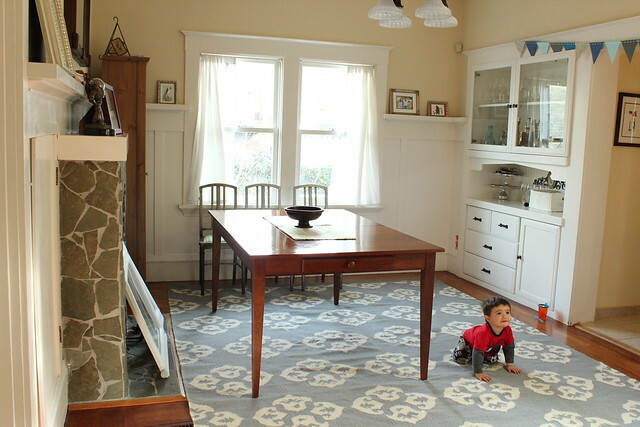 I measured the room and determined that, while an 8×10 rug would be just a little too large (thanks to the fireplace which we would get rid of if we could) it was still our best fit. Any smaller and it wouldn’t comfortably accommodate the table and chairs. When we got to West Elm, I was taken aback by the roughness and scratchiness of the Andulusia. I had never dealt with mostly wool dhurries before and didn’t realize how rough they feel initially. I expected to feel more like the Graduated Stripe rug, which is a cotton dhurrie: it’s much smoother and softer right out the gate. I started to doubt if this is the rug that would be best for us. But, when I was wondering around the store, I felt the dhurries that were on display. They were so soft! Once I realized that, with use, the rug would soften and still look beautiful, I was sold. We chose the Andulusia in Feather Grey/Ivory (I was torn between the grey & yellow, but the Mr was grey all the way) and shelled out the big bucks. I brought the rug home in my car (it just barely fit) and, after grabbing a rug pad from Le Targét, we set out to get that rug rolled out. 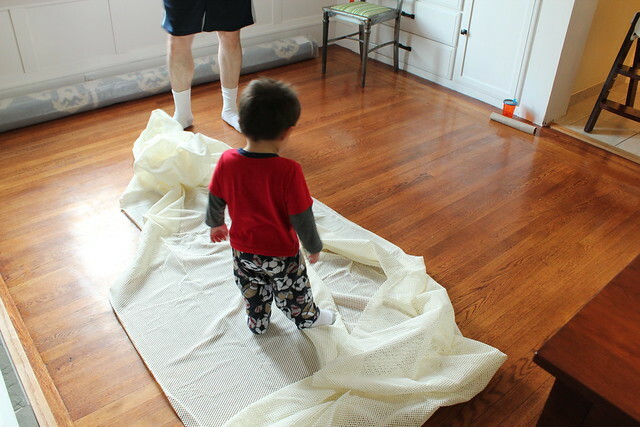 Then, Lil’Man stomped on the rug pad to ensure it was, indeed, non-slip. Finally, we rolled it out and moved the table back into place. Lil’Man crawled around and under, giving it his seal of approval. The room is far from done, but I think this rug will redirect how I’ll decorate this room. The grey is a cooler color than I usually bring into the house and I think that’s a good thing. Color-wise, it’s just slightly out of my comfort zone. However, I’m liking the warm wood against the cooler grey. Plus, the chair seats are getting a bit dingy and I’ve been wanting to recover them for a while, but wasn’t sure what I wanted. Now, I’m thinking a bold, navy print will look great. And the table needs a new runner — the warm greens that play off the seat cushions just don’t work anymore. For now, I’ve switched to a ramie runner. 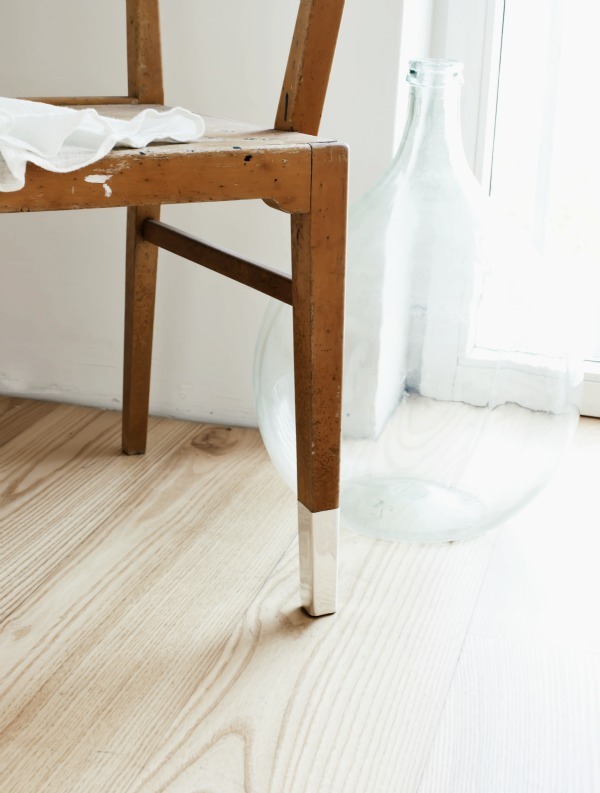 It’s a nice neutral and the rough texture is a nice contrast. But Easter is coming up and we need a fresh look. Time to play with more color! 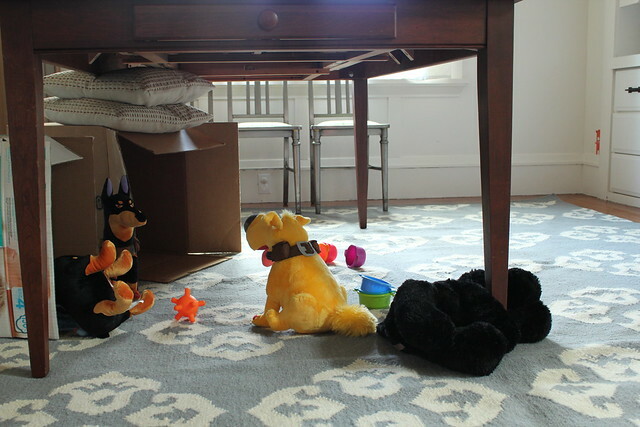 Oh…and if you’re wondering why the table is off-center, it’s because this is what it looks like under the table right now, thanks to a boys’ day alone while I was out having some quality time with my best friend. This photo illustrates pretty well how the room is currently used. And, in full disclosure, I crawl under there with Lil’Man and his papa sometimes. Why let the boys have all the fun? Well, I do. I think it’s fun and friendly and it makes me smile. I get compliments on it all the time, from women, men, teens and at least one toddler. It always takes me by surprise because who expects the random person behind them in line to be checking out their wallet? In a non-pickpockety way, at least. Even if I didn’t get compliments I’d love it. The illustrations on it make me smile, even when I’m about to pull out my credit card to pay some god-awful amount of money. I also get asked where I bought it on almost a bi-weekly basis. I always feel bad that I can’t answer that definitively because I bought it about eight years ago at an SF Maker Faire and never really thought about it again. So many of those little shops pop up, sell something wonderful and lovely and then disappear forever. My shopping heart has been broken too many times, so I try not to get too invested. However, even though my wallet is still going strong, there is some wear going on along one of the inner seams (what’s with all the wallet opening & closing? Sheesh.) I thought maybe I should see if I could find this shop if it was still around and grab a new wallet as a backup. 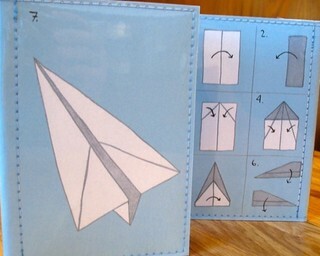 All I had to go on was a little logo on the back of my wallet: a speech bubble that says “tiny!”. Thank goodness that was enough! Say hello to Tiny Meat. It’s a small company based out of Portland, Oregon. That surprised me because I thought they were local to the Bay Area. Localist bias, I guess. 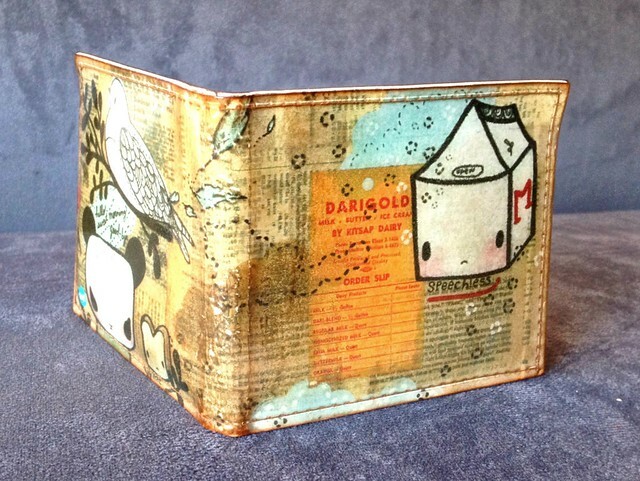 They have their own website, but I found that they offer a much wider selection at their Etsy shop. 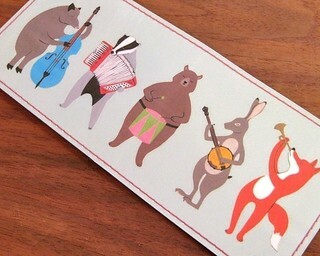 They no longer carry the design that is on my current wallet (*sniffle*), but they still have a great selection. 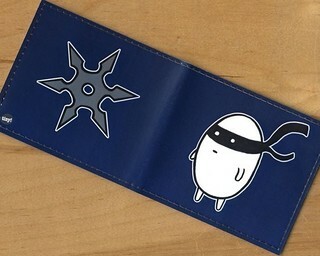 I mean, seriously, who DOESN’T want a wallet with a ninja egg on it? That is sheer genius! I included those last two just so you don’t think they only make funky, illustrative cases. I promise, they aren’t just for hipster (I am living proof of that). 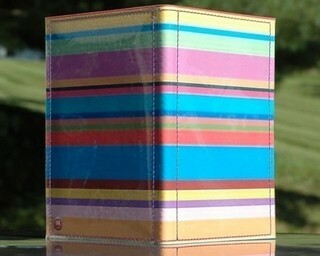 You can also get a more elegant and/or trendy case. They have stripes, argyles, and some beautiful abstract florals. I think, for now, I’ll stick to getting on my quirk in small, wallet-sized doses. 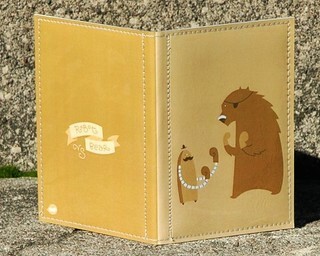 If anyone is in the market for a new wallet (or card case or passport cover), I strongly suggest Tiny Meat! P.S. No one at Tiny Meat asked me to plug their wares. No one there even knows I exist. Well, maybe the person who sold me my wallet all those years ago, but probably they won’t remember me. 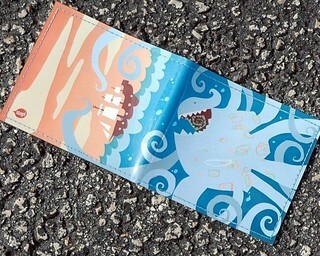 I just really like my wallet and think everyone should like their wallet as much as I do.